When we interviewed Mark Palmer-Edgecumbe — the man behind the Jack the Ripper Museum — in July, he told us his intention was always to open a museum of East End women, just with the focus on the London of Jack the Ripper. Even back then, we predicted that Palmer-Edgecumbe was in for a bumpy ride. In an effort to make that ride smoother, Mark has appointed PR man Joshua Walker. Walker has already taken Class War for a cup of tea and describes the group — who protested outside the museum — as "lovely, feisty women". He’s been contacting countless newspapers and blogs too. And he invited us for a look around the museum, which we took him up on. The origins of the museum are controversial and contested: those behind the enterprise claim it’s an evolved women’s history museum that now happens to look like a Jack the Ripper Museum. Almost all others doubt that story. The application to Tower Hamlets council to change the use of the house they occupy to a museum came with a slick and worthy document full of images of women protesters from the East End and beyond. There was no mention of Jack the Ripper in it. We enter through the gift shop (entry is £12), with trinkets including glasses and mugs, some with blood splatters, others without. 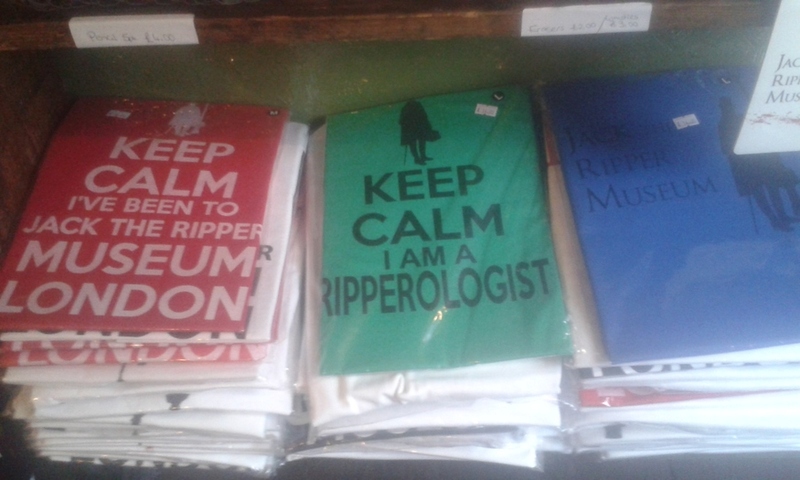 There are Jack the Ripper top hats, and two varieties of ‘Keep Calm’ t-shirts. On the way down to the basement Walker points out the text on the stairs describing East End life in the 1880s. The images of poor Whitechapel families and ruined streets are good, but uncredited. We ask which archive or museum they were from. Walker doesn't know. Descending to the basement, we come to a mock-up of a mortuary. There’s a rickety wooden table in the centre and open drawers: the ones bodies were put into. On the walls are strange almost-shrines to the victims; a mirror for each name, a brief biography and a mortuary photograph of each victim if available. There are gory details: cause of death and a list of their injuries. Jack the Ripper studies list five ‘official’ victims — the so called canonical five — but the morgue lists more, including Emma Smith, Frances Coles and Alice Mackenzie, who all died outside of the accepted Ripperologist timeline. Next we come to a mannequin representing Catherine Eddowes, widely accepted as the second Ripper victim. She lies face up, without any injuries showing. An effigy of PC Edward Watkins (he found Eddowes) leans over the body and there are cries of murder on loop. The infamous "The Juwes are the men that will not be blamed for nothing" graffiti — discovered near Eddowes’s dropped apron on Goulston Street — is on one wall along with a letter G in the style of a freemason design. The cart with straw on it is, Joshua tells us, is ‘authentic’ as it's from the same period. At this juncture, it's worth noting there is no evidence that a ‘Jack the Ripper’ ever existed. The women listed in the basement were all murdered in or around Whitechapel, but so were many other people. 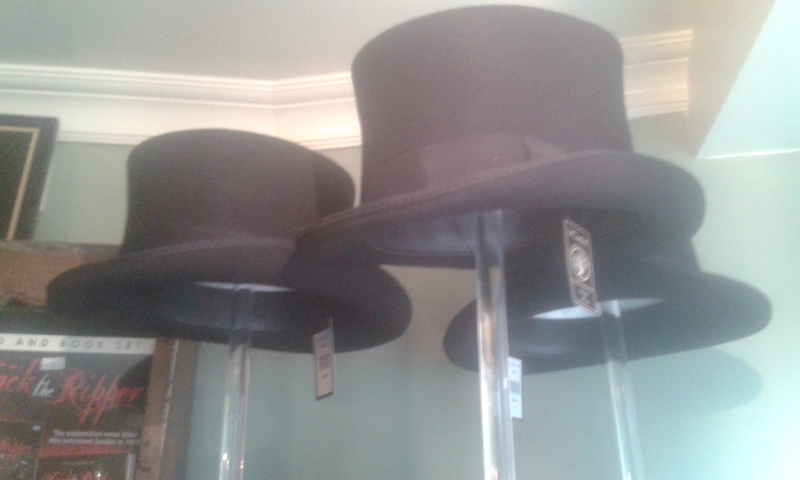 The capped, top-hatted masonic figure of popular myth and the Jack the Ripper museum logo is a fiction. And so the next room — Jack the Ripper’s study — is an unmitigated invention. There is a skull on the mantelpiece (seriously), the signature cape on the coat hanger and a desk with small ornamental obelisks and other paraphernalia that entered Ripper mythology via Iain Sinclair’s Lud Heat and was popularised in Alan Moore’s From Hell and its subsequent film adaptation. This is not a room that belongs in a museum; it is a fiction. In our interview, Mark told us that Cathy Ross*, author and Honorary Research Fellow at Museum of London, had been consulted. We ask Joshua how long she was contracted for. Joshua doesn’t know, he’ll ask Mark. We’re no expert on Victorian police stations, which is the fourth room, so will have to take Fern Riddell, a historian who consults on the BBC’s Ripper Street, at her word when she describes it as the most inauthentic Victorian imaging”. Riddell was apparently talking about a room in which a voice grumbles away about workload and a mannequin sits at a desk surrounded by letters from those purporting to be the Ripper. But hang on — we thought the National Archives held the famous ‘Dear Boss’ letter and others; did the Jack the Ripper Museum get permission to display copies? Joshua will find out for us. We can't deny, however, that there are some actual artefacts in this room; the whistle, truncheon and notebook PC Watkins was carrying when he discovered Catherine Eddowes. They were bought at auction on 10 December 2014 for £17,700 by, the BBC reported at the time, a buyer who “wanted to remain anonymous and was going to put the items in a private museum in the UK”. We suggest that the page describing Watkin’s discovery of Eddowes should be open for people to view. The book is not in there, Joshua tells us. It’s just the leather cover. The final of the five rooms is the most effective. In that it actually is effective. It’s a recreation of Mary Kelly’s bedroom, the final ‘official’ victim. The bed is tatty, the wallpaper is grimy and a woman somewhere is singing. On the walls are photographs of the victims with biographies, and in a small adjoining room, quotes from each victim shortly before their deaths are printed on the wall, presumably taken from witness statements. 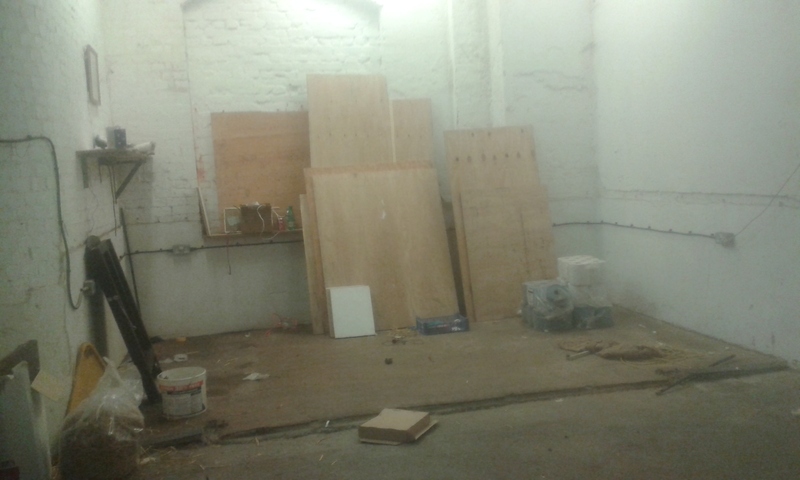 Like the mortuary the room has an artistic feel — something you would walk into at Goldsmith’s graduate show. We do learn more about the women of the story and the room manipulates the emotions. But one room dedicated to the lives of a group of women does not make a women’s museum, and overall the quality of the ‘exhibits’ here verges on the insulting. 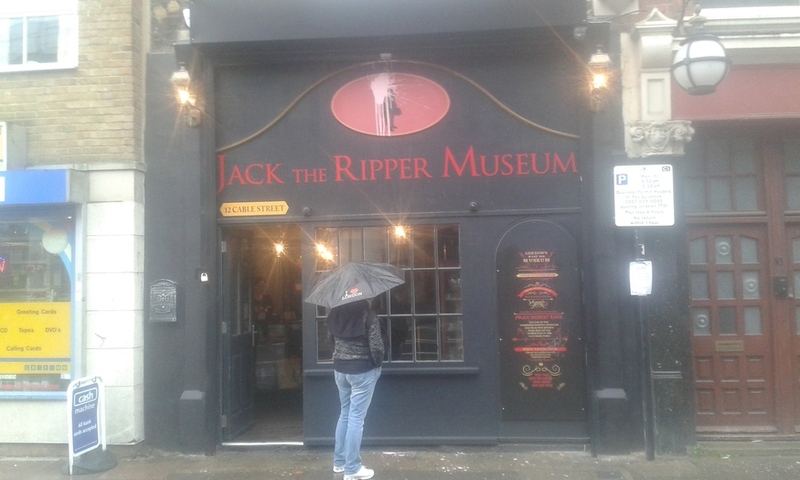 When we met Mark earlier this year he told us that the full name of the museum is the “Jack the Ripper and the History of Women in East London" and that the frontage of the museum was not finished. It has since been vandalised and redecorated but the women, again, remain excluded. There is, however, a plan. At least Walker says there is. The museum is renting two railway arches and space across the road. Walker takes us for a peek. He says there will be temporary exhibitions, events and discussions held here — all about East End women. There will a press release in November, and they are very excited to be working with the Amy Winehouse Foundation. But isn't this just a further admission that the Jack the Ripper Museum isn't broaching the issues that it promised to? If it isn't, then something else Walker tells us next, is. “We can safely assume,” he says, "that a museum of Suffragettes and match girls would not have the appeal. About to leave Walker and the museum, we feel we have more questions than we came with: does the museum have permission to use the Ripper letters or the images of the East End? How long was Cathy Ross employed to help curate the museum? Who is Helena? We've given Walker a week and a half to answer some of these for us. He says he'll speak to Mark. "I would like to make it clear that I was not the curator. 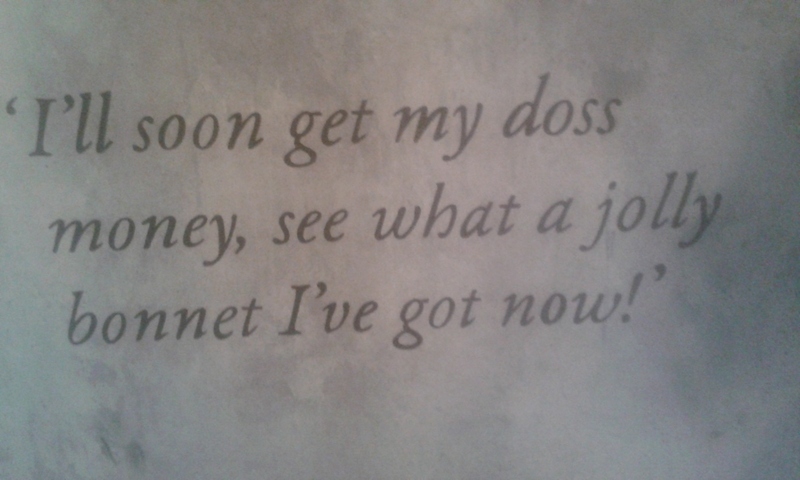 I was asked by the museum’s designers to supply some written text, for a scheme that had already been defined. I have never set foot inside the building, nor made any of the overall content choices." Cathy has told us she was asked by one of the museum’s designers to write panel text and object labels for the museum in February 2015, and that it was understood that this text might be re-purposed for a guide book. However, she did not hear anything further from the museum once this batch of text had been delivered in May 2015. After our tour of the museum two weeks ago, and before Cathy contacted us, we twice asked Joshua Walker how long Cathy had been engaged the museum. We have received no answer from him or Mark Palmer-Edgcumbe.